Warning: this book review contains a spoiler. No, I’m not going to give away the plot of this Cornell Woolrich thriller (originally published under a pen name), I’m going to alert you to a spoiler of sorts, written by the author himself. But I’m getting ahead of myself. City homicide detective Tom Shawn is on his way home from work late one evening, walking along a river. As he approaches a bridge, he finds money, loose bills drifting in the breeze like leaves. As he turns across the bridge he finds a diamond ring, then a purse. This shadowy bridge setting and the scenes immediately following exemplify noir as well as anything written during the period and pull you into a twisted tale. He’s surprised to find that she’s a beautiful young woman, barely 20. She tells Shawn she’s afraid of the stars twinkling above, so they make their way to a deserted restaurant where Shawn persuades her to tell her story. She begins rambling on about “darkness and fear and pain and doom and death.” As she begins to settle down and explain, she soon outlines the theme of the book saying, “…God permits us to look backward, but God has forbidden us to look forward. And if we do, we do so at our own risk.” Her lengthy tale involves her father, a wealthy investor, who has become involved with someone who seems to be able to predict the future. The predictions bring a promise of riches and fears of death. The story of Jean Reid and her father draw Shawn into a race against time and against capricious, malevolent forces that ultimately mobilize the city detective squad. Woolrich’s noir style and attention to details highlight the novel. An early chapter focusing on terror is as close to Poe as anything I’ve read by Woolrich and one of the later “police procedure” chapters demonstrates–at length–the finer points of tailing a suspect. As I read, I was dragged firmly into the heroine’s malaise until it sounded familiar. Too familiar. I had not read the book before, yet after rounding the half-way point in the novel, I knew exactly what was going to happen. Was a book about clairvoyance imparting some of its mystical powers? Was Woolrich a plagiarist? I found the answer–although I had a notion what the problem was–in the book’s introduction by Woolrich biographer, Francis M. Nevins. He explained the 1945 novel was based on a novella Woolrich had published eight years earlier. And I read the novella, “Speak to Me of Death,” in a Woolrich collection some time before. Apparently this is not the only short story or novella that Woolrich turned into a novel. So, my advice for readers who are just getting into Woolrich is to be cautious. Try several novels before you pick up a story collection. If you have already read Woolrich short stories, there’s still hope. Most Woolrich books available today come with introductions by Nevins or others. Scan the intro to see if the novel might be based on a short story you’ve read. In a cursory online search, I could not find a list of his novels that come from his shorter works. In fact, some of the references in the first search engine list I encountered were to this blog. And don’t be fooled by the different names Woolrich used. As mentioned, this book was originally published under a pen name, George Hopley, Woolrich’s two middle names. He also published under the name William Irish. 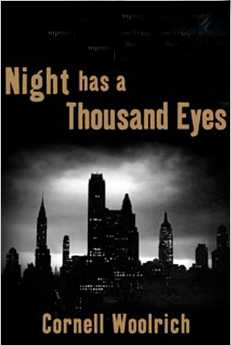 Meanwhile, back at the Thousand Eyes, the race against time that Shawn and other detectives embark on is typical of Woolrich thrillers and as Nevins says in the introduction, imminent death and the ticking of the clock are as central to this book as any Woolrich novel. (The description is also true of the story, “Speak to Me of Death.” ) Incidentally, the novel title comes from two of the characters’ aversion to stars, i.e. a thousand eyes. Perhaps due to the novel’s genesis, it has more than one climax. In fact, it has more ups and downs than many mysteries, making it something of a noir rollercoaster. You will cling tightly to the coaster’s safety bar waiting to see if there’s a final descent and crash. Very good presentation. Made me interested in looking up the author and read a novel (my bad for not doing this already). Recommendation for a first read? Thanks! Good question. I will address that in my blog tomorrow. Stay tuned. Your intro of the story was so compelling I’m considering reading the book!